This fantastic color postcard purports to be a record of the Virginia and Truckee Railroad's last trip. This is doubtful because the engine pictured is #5, and not #27 which was actually involved in the final run on May 31, 1950. It's also doubtful because there are no crowds thronged around the train and the platform. It's true that on most days the V&T was about this busy, but on its last day people came from all over to see the line off, and there were huge crowds in both Carson City and Minden. This shot is from the railroad's last years though, if not exactly from its final day. Engine #5 (actually the second engine to carry that number) was brought into service in 1947 after being bought from the Nevada Copper Belt Railroad in the Mason Valley. The #5's service was short-lived. The railroad went out of business in 1950, and the engine was scrapped soon after. 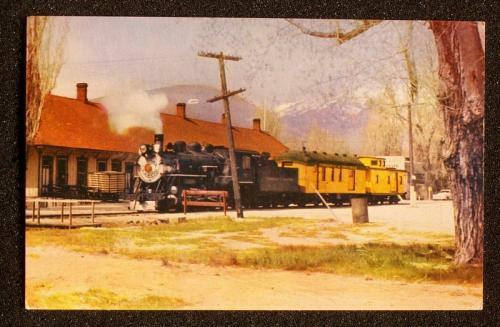 So this shot of #5 resting at the Carson depot, hauling one solitary car and a caboose, had to have been taken after 1947 but before May 31, 1950. Source Caption: Virginia and Truckee Railroad on its last trip. This historical line finally lost out to highway transportation after almost a century of colorful activity. This photo could well have been taken after May 1950. In his book, "The Silver Short Line" [which I have in front of me], railroad author and historian Ted Wurm has placed a B&W photo of engine #5, with steel mail car #23 behind it [same as in the photo above] and with the wreckage of #26 behind that, making the very last trip on the V&T. The photo is on page 210 of that book. The photo caption reads, "V&T's last trip of any kind plodded slowly into Reno on November 2, 1950, five months after abandonment. Pulled by locomotive No. 5, it consisted of steel mail car 23 and the hlk of burned locomotive No. 26". The photo is credited as "Nevada State Journal Photo from Nevada Historical Society".